The old car number plates still carry the inscription beloved of the people of Plateau State in central Nigeria: â€œLand of peace and tourismâ€. Years of spiralling violence have rocked the region of outstanding natural beauty. But tired of the unrest, young hikers have now decided to revive the slogan. Every weekend, Andrew Niagwan and his friends defy the insecurity to chart new trails and kick-start tourism in the breathtaking lush countryside around the state capital Jos. 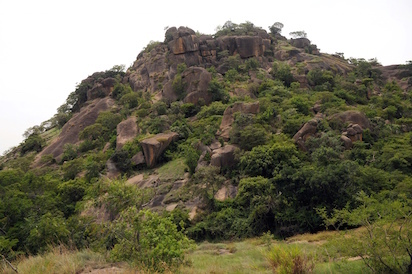 In this file photo taken on June 5, 2014 the Amurum Forest Reserve, where undulating rock formations surround a savannah dominated by lush and tall grass in Jos, Plateau State is pictured. â€“ Years of spiralling violence have rocked the region of outstanding natural beauty. But tired of the unrest, young hikers have now decided to revive the slogan. The otherworldly beauty of the dome-shaped outcrops of rock and established hotels have long made Plateau a favourite holiday resort for rich Nigerians and expatriates. But in the early 2000s, the tourism market cooled off after bloody outbreaks of violence between Christian and Muslim communities rocked Jos and the surrounding area, killing more than 10,000 people, according to Human Rights Watch. â€œWe now have over 60 hiking locations and we are still discovering some more,â€ Niagwan says as he hikes nearing the top of the Shere Hills, a mountain range that not so long ago attracted tourists from across Nigeria. â€œFor years, people used to avoid the area, but thanks to us the hiking fever is back,â€ Niagwan, a tall psychology graduate in his thirties, says proudly. Now newcomers like â€œThe Hike Teamâ€, â€œJos Hike Itâ€, and â€œThe Wayfarers of Josâ€ are also organising weekly walks in the hills. â€œDuring the crisis with the curfew we have to stay indoors and the internet has been the best companion,â€ says 26-year-old hiker Metou Kwallo. â€œGone are the days when the Queen of England stayed there,â€ says Mankat Dewa, a local entrepreneur, recalling the visit of Elizabeth II in 1956, when the hotel still hosted lavish banquets in its lush gardens. Aware of the regionâ€™s potential, Plateau Governor Simon Lalong said at the beginning of November he wanted to â€œresuscitateâ€ tourism at a conference on the subject in Jos. â€œWe are going to focus and put more attention on tourism as a source of revenue for not only Plateau State but also for Nigeria,â€ he said. â€œOf course, we need to adapt the situation. We avoid areas where attacks took place in the last months,â€ says Niagwan.